John Perkins was for many years one of the world’s top economists. He worked directly with the heads of the World Bank, IMF, and other global financial institutions. He quit this work in the 1980s because morally and ethically, he felt it was wrong to play such a key role in creating world empire at the expense of the less advantaged around the world. After being persuaded and even bribed not to write a book about his experiences, Perkins states, “When 9/11 struck, I had a change of heart.” The book, Confessions of an Economic Hitman, spent many weeks on amazon.com’s bestseller list and has been widely acclaimed. Below is a summary of this landmark book and ideas on how you can help to build a brighter future for us all. Note: For an excellent, engaging two-minute video summary of Perkins’ story, click here. 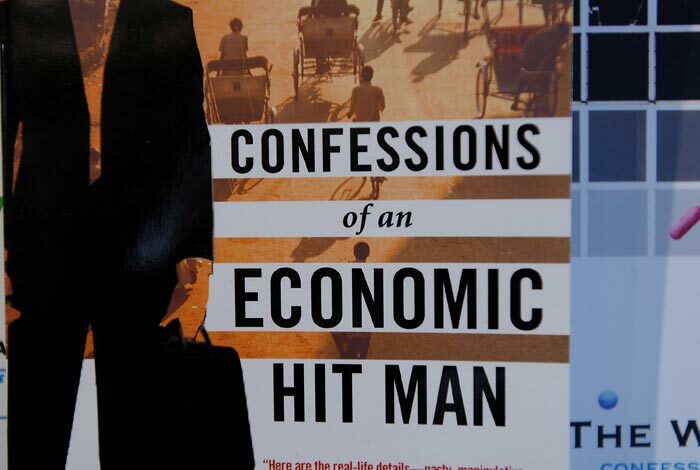 Confessions of an Economic Hit Man is John Perkins’ fast-paced autobiography, which reveals his career as an economist for an international consulting firm. Perkins says he was actually an “Economic Hit Man.” His job was to convince countries that are strategically important to the United States to accept enormous loans for infrastructure development and to make sure that the lucrative projects were contracted to U.S. corporations. Perkins takes the reader through his career and explains how he created economic projections for countries to accept billions of dollars in loans they surely couldn’t afford. He shares his battle with his conscience over these actions and offers advice for how Americans can work to end these practices which have directly resulted in terrorist attacks and animosity towards the United States. Perkins defines economic hit men as “highly paid professionals who cheat countries around the globe out of trillions of dollars. They funnel money from the World Bank, the U.S. Agency for International Development (USAID), and other foreign ‘aid’ organizations into the coffers of huge corporations and the pockets of a few wealthy families who control the planet’s natural resources. He was supposed to justify huge loans for countries. These loans would be for major engineering and construction projects, which were to be carried out by MAIN and other U.S. companies such as Bechtel, Halliburton, Stone & Webster and Brown & Root. He was supposed to help bankrupt the countries that received these loans after the U.S. companies involved had been paid. This would make sure that these countries would remain in debt to their creditors and would then be easy targets when the U.S. needed favors such as military bases, UN votes and access to natural resources like oil. Perkins’ job was to produce economic growth projections that would make the case for a variety of major projects. If the U.S. decided to lend a country money, Perkins would compare the economic benefits of different projects such as power plants or telecommunications systems. He would then produce reports that showed the economic growth the country would experience due to these projects. These economic growth projections needed to be high enough to justify the loans. Otherwise, the loans would be denied. All of these projects were meant to make huge profits for the contractors. The U.S. engineering and construction companies involved would be assured of great wealth. At the same time, a few wealthy families and influential leaders in the receiving countries would become very happy and very rich thanks to these loans. The leaders of these countries would also have bolstered political power because they were credited with bringing industrial parks, power plants and airports to their people. The problem is that these countries simply cannot handle the debt of these loans and their poorest citizens are deprived of health, education and other social services for several decades as these countries struggle economically to overcome their huge debts. Meanwhile, the huge American media conglomerates portray these projects as favors being provided by the United States. American citizens in general have no trouble believing these messages, and in fact are led to perceive that these actions are unselfish acts of international goodwill. Ultimately, due to the large debts, the U.S. is able to draw on these countries for political, economic and military favors whenever desired. And of course, the U.S. corporations involved with the expensive projects become extremely wealthy. Economic hit men [EHM] don’t actually work for a United States government organization such as the Central Intelligence Agency. The risk with such a direct association is obvious. For example, if an EHM was working to put a country in debt to the U.S. with the main reason being for favorable military and political positions against the Soviet Union, the Soviet Union would be quite likely to take military action against the U.S. if that EHM were found to be working for the U.S. government. In the 1960s, America found a way to use economic hitmen without directly implicating Washington. It was during the 1960s that we saw the empowerment of international corporations and multinational organizations such as the World Bank. This allowed for governments, corporations and multinational organizations to form mutually beneficial relationships. United States intelligence agencies were able to use these relationships to their advantage. Government organizations such as the National Security Agency (NSA) were now able to screen for potential economic hitmen (as they did with Perkins) and then have them hired by international corporations such as MAIN. Perkins married a former college classmate in 1967. A good friend of her father’s, referred to as “Uncle Frank”, was a top-echelon executive at the NSA. Uncle Frank immediately took a liking to Perkins and informed him that a job with the NSA would make him eligible for draft deferment, meaning he could avoid fighting in the Vietnam War. After extensive interviews with the NSA, Perkins was offered a job, but declined it to instead join the Peace Corps. Surprisingly, Uncle Frank supported this decision, largely because it meant that Perkins would have the opportunity to go to Ecuador and live with the indigenous people of the Amazon region. It was with the Peace Corps in Ecuador when a vice president of Chas. T. Main, Inc. approached Perkins about working for MAIN. The man explained that he sometimes acted as an NSA liaison, which made this job opportunity a perfect fit for Perkins, who had intended on accepting the NSA job when his Peace Corps tour was over. Shortly after being hired, Perkins was trained confidentially by Claudine Martin, a special consultant to MAIN. It was Martin who explained to Perkins what his real job was. It was Martin who explained that he was now an “Economic Hit Man” and that once he accepted this job, he could never leave it. Perkins’ first assignment took him took to Indonesia. Indonesia was an oil-rich country and had been described as “the most heavily populated piece of real estate on the planet.” Perkins’ job was to produce very optimistic economic forecasts for the country, showing that by building new power plants and distribution lines, the country’s economy would explode. These projections would allow USAID and international banks to justify huge loans for the country, which would then be paid to U.S. corporations to build the projects. In 1971, Indonesia had become even more important to the U.S. in its battle against Communism. Potential withdrawl from Vietnam had the U.S. worried about a domino effect of one country after another falling under Communist rule. Indonesia was viewed as the key. If the U.S. could gain control of Indonesia (with the debts that would incur thanks to the loans for these huge projects), they believed it would help ensure American dominance in Southeast Asia. While spending three months in Indonesia to conduct interviews and study the economic potential for the country, Perkins was exposed to the drastic discrepancy between the wealthy and the extremely poor in Indonesia. While there were certainly signs of a striving economy with first-class hotels and mansions, Perkins also personally saw the tragic side of Indonesia where women and children bathed in wretched, sewer-filled water and beggars packed the streets. He also met some of the country’s native citizens and learned of their resentment of American greed and extravagance in the face of their starving children. These close encounters with the Indonesians created a struggle of conscience for Perkins. He wondered if American capitalism was really the answer for the people of Indonesia. He wondered if the population as a whole would really benefit from the infrastructures the U.S. wanted to build in Indonesia, or would it only be a wealthy few who became even wealthier while the rest of the country became more entrenched in poverty and became even more anti-American? While conducting his studies in Indonesia, Perkins was encouraged by his superiors to create strong forecasts for economic growth. He was told that growth rates of 17 percent per annum were expected. Also providing economic forecasts for MAIN was an older employee named Howard Parker. Parker told Perkins not to be pressured by his superiors, he told him not to buy into the game, not to create unrealistic projections. He told Perkins that the electrification project could not create economic growth rates of more than 7-9 percent. Conversations with Parker led to more conscience battles for Perkins. Ultimately, he told himself that the decision wasn’t really his to make, it would be up to his bosses and they could simply choose between his high economic forecast and Parker’s lower forecast. When the final projections were presented to the executives at MAIN, Perkins’ figures pleased his bosses with 17-20 percent growth rate projections while Parker’s forecast came in at eight percent. Parker was promptly fired and Perkins was promoted to Chief Economist at MAIN and received a nice raise. Again, Perkins experienced the enormous differences between the wealthy and the poor. However, in Panama, the differences were most extreme in one area, the Canal Zone. In the Canal Zone, Americans lived in beautiful homes and enjoyed golf courses and first class shopping. Just outside of the Canal Zone, Panamanians lived in wooden shacks and among overflowing sewage. These harsh differences created high levels of animosity between the Americans living in the Canal Zone and the natives of Panama. It was not uncommon to see graffiti messages demanding that the U.S. leave Panama. On his trip, Perkins met with Panama’s president and charismatic leader, Omar Torrijos. Perkins was very impressed with Torrijos and became friends with the leader. Torrijos was well aware of the EHM practices and knew fully how the game was played. He knew that he could become a very wealthy man by cooperating with the U.S. companies that wanted to build their projects in his country, but he worried about Panama losing its independence and not taking care of its many citizens living in poverty. Torrijos made a peculiar deal with Perkins and MAIN. He wanted Panama to take back control of the Panama Canal and in doing so he wanted to build a more efficient canal, a sea-level one without locks that would allow for bigger ships. The Japanese, the Canal’s biggest clients, would be interested in financing this construction, which would anger Bechtel Group, Inc. Bechtel was a company closely connected to Richard Nixon, Gerald Ford and George H.W. Bush. Omar Torrijos was concerned that these actions might send the wrong signals internationally. He wanted to make sure that Panama was recognized as an independent country and was not dictated by Russia, China or Cuba. He did not want Panama to be perceived as against the United States. Instead, he wanted it known that they were simply protecting the rights of the poor. Torrijos did want to invest in huge advancement projects in electricity, transportation and communications for Panama, but he wanted to make certain that these projects benefited his entire country, including those living in extreme poverty. To do so would require huge amounts of money from the World Bank and the Inter-American Development Bank. Torrijos worried that his commitment to taking back the Canal would anger the top people at Bechtel so much that it would make it nearly impossible to achieve his plans for these projects. So, Torrijos made a deal with Perkins and MAIN. He told Perkins that if he could secure the financing for these projects, MAIN could have all the work they wanted on this master development plan. Perkins agreed to the deal and would do Torrijos’ bidding. In response to the power of the international oil companies, which collaborated to hold down petroleum prices, a group of oil-producing countries formed OPEC in the 1960s. The huge impact OPEC was capable of became evident to the world with the 1973 oil embargo. This embargo was a result of the United States’ support of Israel when Egypt and Syria launched attacks on the country. As the U.S. provided Israel with more financial aid, Saudi Arabia and other Arab oil producing countries imposed a total embargo on oil shipments to the U.S. While the embargo was short-lived, its impact was huge as Saudi oil prices jumped from $1.39 per barrel on January 1, 1970 to $8.32 on January 1, 1974. As a result, Wall Street and Washington became obsessed with protecting American oil supplies and the U.S. was forced to recognize Saudi Arabia’s importance to its economy. “For Saudi Arabia, the additional oil income resulting from the price hikes was a mixed blessing.” Suddenly, the country’s conservative religious beliefs were being replaced with a sense of materialism. Washington recognized this movement and negotiated with Saudi Arabia for assurance that there would never again be an oil embargo from the country. The result of these negotiations was the United States-Saudi Arabian Joint Economic Commission, known as JECOR. The unprecedented agreement was the opposite of the norm, where countries had to borrow from the U.S. until it could never get out of that debt. Instead, this agreement relied on Saudi Arabia’s own money to hire American firms to build up the country. The U.S. wanted Saudi Arabia to guarantee to maintain oil supplies at prices that would be acceptable to the U.S. and its allies. Due to Saudi Arabia’s vast petroleum supplies, this guarantee would protect the U.S. even if other countries threatened oil embargos. In exchange for the guarantee, the U.S. offered the House of Saud a commitment to provide complete political and military support (this would guarantee that the royal family would continue to rule in Saudi Arabia). The condition would be that the Saudis buy U.S. government securities with their petrodollars and that the interest earned on these securities would be used to pay U.S. companies to convert Saudi Arabia into a modern industrial power. Perkins was brought in as an adviser in the early stages of these negotiations. His job was “to develop forecasts of what might happen in Saudi Arabia if vast amounts of money were invested in its infrastructure, and to map out scenarios for spending that money.” He was told that not only would this job result in huge profits for MAIN, but that it was also a matter of national security. This job was different for Perkins as the final objective was not to burden Saudi Arabia with debts it could never repay, but instead to “assure that a large portion of petrodollars found their way back to the United States.” Basically, MAIN and other U.S. corporations needed to convince Saudi Arabia of the importance and benefits of transforming their country to a more modern nation. This would ultimately make Saudi Arabia more dependent on U.S. corporations and make U.S. corporations extremely wealthy. For his part, Perkins convinced a key player within the House of Saud, a man he calls Prince W., that these projects would benefit his country as well as him personally. Perkins was able to eventually persuade Prince W. by arranging for a beautiful prostitute to live with him. By arranging for the prostitute to live with Prince W., Perkins was able to gain his trust and eventually convinced him of the value of the deal. The entire package was finally approved by the royal family of Saudi Arabia and MAIN was rewarded with one of the first highly lucrative contracts, which was actually administered by the U.S. Department of the Treasury. “The deal between the United States and Saudi Arabia transformed the kingdom practically overnight.” It also marked the beginning of an ongoing relationship between the House of Saud, the bin Laden family and the Bush family, which benefited greatly from a financial standpoint thanks to the deal. Perkins saw his career take off as he was promoted again and became the youngest partner in the history of MAIN. He would go on to head major projects all over the world while taking home a huge salary. However, Perkins could not stop struggling with his conscience over the negative outcomes he believed he was causing as an EHM. In 1978 and 1979, the consequences of EHM empire building became clear to Perkins by what he saw happen in Iran. While the U.S. had supported the shah, the results had led to class wars and passionate animosity towards the “corporatocracy” being implemented in Iran. Perkins had seen this hostility first-hand in several of the countries where he had helped to create similar situations with his EHM practices. Citizens of these countries hated U.S. policy and blamed it for their corrupt leaders and despotic government. In Iran, the situation escalated and led to the shah fleeing the country for his own safety and Iranians storming the U.S. Embassy and taking 52 hostages. It was then that Perkins fully realized that “the United States is a nation laboring to deny the truth about its imperialist role in the world” and he became overwhelmed with guilt over his role in this global movement. Perkins sank into a depression and quit his job at MAIN in 1980. Perkins would continue to be haunted by the impact of economic hitmen even as he started his own company (a company that committed to producing environmentally friendly electricity), did special consulting for MAIN and other corporations, and became involved with nonprofit organizations and their efforts to work with and help indigenous people in Latin America. In 1981, Perkins became deeply disturbed by the death of his friend and the leader of Panama, Omar Torrijos. Perkins believes that his friend Torrijos’ death in a plane crash was a CIA assassination because of his positions on the Panama Canal (Torrijos had achieved his goal of taking back the Canal) and his unwillingness to cooperate with American corporations. Torrijos was replaced by Manuel Noriega, who “became a symbol of corruption and decadence.” Eventually, in 1989, the United States attacked Panama. The reigns of power were returned to the pre-Torrijos oligarchy, which had served as U.S. puppets from the time when Panama was torn from Columbia until Torrijos took over. Perkins also watched closely throughout the ’80s and ’90s as the U.S. tried to get Iraq and Saddam Hussein to buy into the EHM scenario as Saudi Arabia had done before. Hussein refused and when he invaded Kuwait, the U.S. wasted little time and attacked Iraq. The economic hitmen failed again in their efforts following the invasion of Iraq and in 2003, the U.S. invaded Iraq once again. Perkins began to write Confessions of an Economic Hit Man on several occasions, but stopped due to bribes or threats. But after 9/11, Perkins knew he could no longer wait and felt he had to expose these practices and the devastating consequences they create. Perkins now spends his life trying to educate people about the role of the economic hit man and how we can end their practices and achieve more global peace and prosperity by transforming our institutions. He believes “we have convinced ourselves that all economic growth benefits humankind, and that the greater the growth, the more widespread the benefits.” We must realize that the American capitalism we are trying to push on other countries may not be what’s best for the rest of the world. Read between the lines of each and every media report and help others do the same. The majority of our media outlets – newspapers, magazines, publishing houses, television stations, radio stations, etc. – are owned by huge international corporations and these corporations aren’t afraid to manipulate the news they deliver. Always seek the truth and encourage others to do the same. Cut back on oil consumption and shopping. When you are shopping, be very aware of the products you buy and the companies you’re supporting. Downsize your personal possessions, including your home, your car and your office. Protest against unfair free trade agreements. Protest against companies that exploit desperate people in sweatshops. Protest against companies that pillage the environment. Look for ways to educate others about what is going on in the world. This can be done by writing letters and emails to friends, newspapers, school boards and local organizations. What will I do to help our children, and all children everywhere, to fulfill the dream of our Founding Fathers, the dream of life, liberty, and the pursuit of happiness? These are the essential questions of our time. Note: The above is a slightly edited version of the summary published by CapitolReader.com. For an excellent, engaging two-minute video summary of Perkins’ story, click here. Perkins has written many other books including The World Is As You Dream It and The Stress-Free Habit. To educate yourself as recommended by Perkins, click here.